2018 has been a rough year for digital privacy, but this is the home stretch. Many shoppers will be looking for retail therapy this holiday season, scanning retail shelves and storefronts across the Web. When the shopping’s over, and the presents are opened, what will you have given your friends and loved ones? Will you have saddled them with spying “smart home” appliances, mobile app trackers, and eavesdropping speakers? Tech doesn’t have to give people the agita of home surveillance—give the gift of privacy this holiday season. All Purism laptops will be on sale from Black Friday through Cyber Monday. And you can even pay with monthly installments now! an economic vote signalling demand for security, privacy and freedom, supporting our R&D efforts. Indeed, you are not just buying hardware: the margins we make on hardware sales are what pays our team of 30+ people to do software, firmware and hardware enablement work around coreboot, PureOS, the Librem 5 phone platform, and services and support. 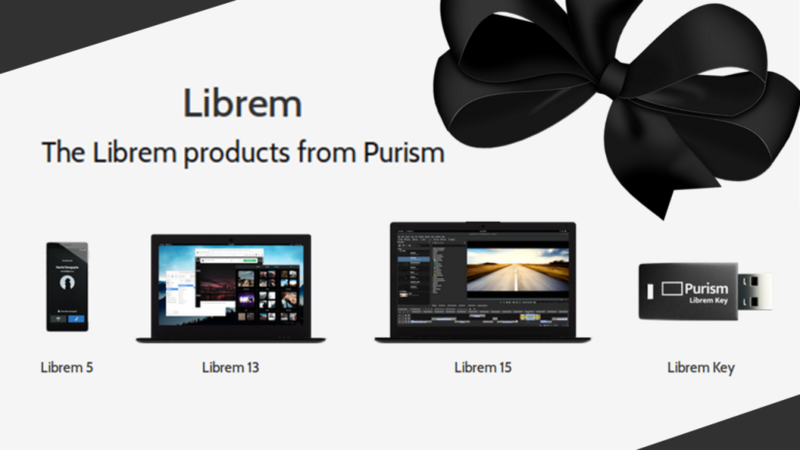 Our Librem line of laptops ship with PureOS, an operating system that meets the high standards of the Free Software Foundation’s endorsement, and coreboot as a replacement for proprietary BIOSes. The Librem 5 smartphone will ship with it too, raising the bar for private and secure mobile devices worldwide and challenging Apple and Google to meet that standard. When Apple CEO Tim Cook was deriding Facebook for it’s dismal privacy record, he said Apple was “not going to traffic in your personal life” and that privacy is a “human right” and a “civil liberty”. At Purism we agree with this sentiment, but we also ask Apple to take a long look in the mirror. Macbooks contain a “security” microchip that contains secret, unverifiable, proprietary code. The T2 chip not only means the “Hey Siri” voice assistant is always listening, it can also brick your Mac if you don’t follow Apple’s repair rules. iPhones, it turns out, are just as bad as Google’s Android when it comes to tracking you. In one experiment, an iPhone was found to be making contact hundreds of times with Apple’s servers and third-parties, while the user was sleeping and the phone was “inactive”. Worse, Apple invented the iBeacon standard that is now used worldwide to track the movements and proximity of users to each other, to smart digital signs, and to products in malls and grocery stores. Though Apple has been able to dodge privacy criticisms with hand-waving and clever marketing, Tim Cook was on the defensive this week when asked about the company’s relationship with Google. In 2018, the world has had to face the reality that surveillance tech tries to track and monetize our every move. Make room for Purism on your shopping list and you make a change for 2019, distancing yourself from the data merchants watching everyone, even in their sleep.